A regional daily editor has become the latest to defend his newspaper’s neutrality after more regional press titles ran front page wraparound advertisements for the Conservatives. The News, Portsmouth, was one of a number of papers across the country to run the wrap endorsing the Tories – but editor Mark Waldron told readers he wanted to make it “quite clear” that his title did not support any political party. The advert in question features a picture of Theresa May and urges readers to “vote for the best person to negotiate Brexit for Britain”. It has also appeared on the front of papers including the Bath Chronicle, Belper News, The Cornishman and the Mansfield Chad. 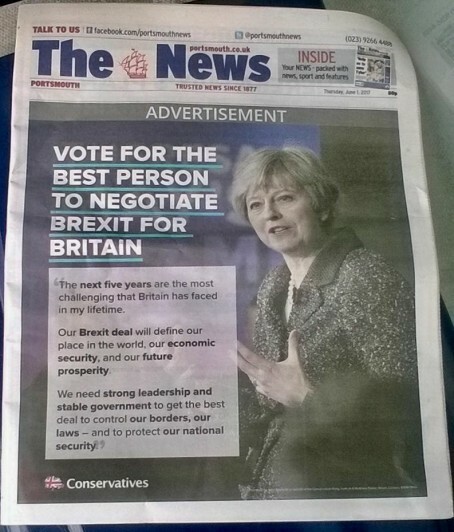 Last month a front page ad endorsing the Tories was run by many local titles, and led news chiefs including Newsquest group managing editor for South London and Sussex Andy Parkes, Exeter Express & Echo editor Jim Parker and Devon Live editor Patrick Phelvin to issue statements reaffirming their titles’ commitment to editorial neutrality. The latest Tory wrap appeared on the front of Thursday’s edition of The News. In his editorial inside the paper, Mark wrote: “Having got this far you will have spotted that we are carrying an advertisement ‘wrap’ for the Conservative party today. This four-page advert has been purchased and paid for by the Conservatives, something they or any legitimate party is entitled to do as part of their election campaign. “They have placed similar ads in newspapers across the country as a means of getting their message across to the electorate. Let me make it quite clear, this newspaper does not support any political party. We support or challenge politicians and political parties based on the decisions they make and not the colour of their rosettes. This has not changed with today’s wrap. “Political parties have long held to the belief that they value a strong, independent press as vital to local democracy. Advertising is the lifeblood of that free and independent press. I wish editors wouldn’t try to convince the public( and themselves) that a political wrap is in some way a party supporting a ‘ vibrant local media’ iti isn’t and it’s naieve to think this is why they’re run. they run them because they know the publishers,desperate for any ad revenue it can get, will run them and in the belief that their ‘advert’ will come across to many as news and the views of the paper, they know they can dress up a political message to look in all intents and purposes like that eeeks front page news. If they were simply putting a message across they’d do so in the form of an advert, flyer or leaflet, none of which attempt to look anything other than political campaigning. If an editor believes otherwise I would suggest he’s out of touch with modern media campaigning or the commercial managers have more say than an editor as to what goes into the paper. desperately enough and can’t attract sufficient advertising by other means but tell readers the reason is purely financial,then they will make their own minds up on the matter of impartiality, just don’t try to pass it off as being no worse than other publishers accepting political cover wraps or as the party helping to support local papers. Quite like Blackpool version, though: next to a huge plug for their (now inside) splash on the scandal of foodbanks.